Among the colorful personalities of the late Georgian/Early Victorian world of the 1830s Lady Hester Stanhope stands out for her brilliance, independence, and sheer brazen disregard for social mores. If ladies rode sidesaddle; she rode astride. In a world in which a woman’s highest goal was to be married, she didn’t. In a world in which love affairs were kept discreet, hers were blatant. In a world that judged women by their appearance, she wore men’s clothes and native dress once she found them more comfortable. In a world in which needlework was considered an accomplishment, she led one of the earliest archeological digs in Palestine. In a world in which women were expected to confine their world to home and hearth she traveled the Mediterranean and ended her life in genteel poverty in a hill fortress in Palestine, sheltering refugees at odds with Ottoman officials and welcoming travelers. Lady Hester Stanhope grew up in an unusual household. Her father, though an earl, fancied himself “Citizen Stanhope,” and professed revolutionary beliefs. Her mother died when she was quite young, her stepmother largely ignored her, and her father, as he got older, kept to his country estate and devoted himself to science. Intelligent and forthright, Hester appears to have been the only one to flaunt his authority, going so far as to smuggle her younger brother, the heir, out of the country so he could pursue a university education. Their father tried to keep the boy home and force him to agree to break the entail. She did this with the help of her maternal uncle, William Pitt. Her father broke with her completely after that, and Hester went to live with the Countess of Chatham, her maternal grandmother. If the Stanhopes were unconventional, her maternal relatives were eminently respectable. Her mother had been born Lady Hester Pitt, daughter of William Pitt the Elder who died, alas, when Hester Stanhope was merely two years old. 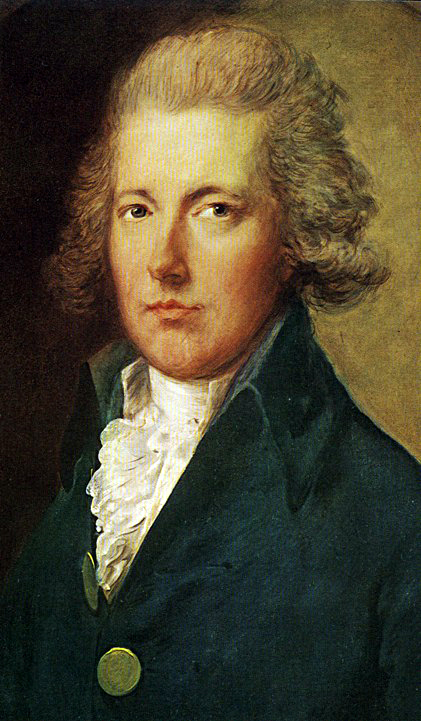 Her uncle, William Pitt the Younger, the brilliant and single-minded Prime Minister would be her biggest support. Her other uncle, John Pitt, 2nd Earl of Chatham, was known to be unimaginative and even indolent. No eccentricity there. The Pitts were, however, a highly principled group, a trait Hester shared. Hester’s grandmother had herself not married until her thirties, and her marriage had by all accounts been a happy one. (That seems to be another Pitt family trait: late marriages and happy ones) While the arrangement suited them both, the grandmother died a few years later. At that point William Pitt invited her into his household. She served as her uncle’s hostess, secretary, and by some accounts a virtual chief of staff. His world of politics and a social circle grounded in intellectual discourse suited her perfectly. Unfortunately Pitt died four years later, nursed by Hester to the end. Before his death he convinced the government to provide Hester and each of her two sisters with a pension. The income enabled her to maintain an independent household, albeit one in straightened circumstances. She is supposed to have said, “A poor gentlewoman is the worst thing in the world.” I suspect that she also felt bored after the life she had led in Pitt’s household. Whatever the case, she left England in 1810 and never returned. Stanhope’s party in 1810 included her brother James, a maid, and young physician she hired as her medical companion, Charles Meryon. They went first to Gibraltar to drop off James. While there she met Michael Bruce, twelve year’s her junior, the third and possibly last of her lovers. The two traveled the Mediterranean, hobnobbing with Byron, enduring shipwreck, and enjoying the company of Arab tribesmen while happily spending Bruce’s father’s money. The shipwreck, in which all her clothing was lost, provided the opportunity to try Turkish dress, which became her preferred apparel for the rest of her life. Stories of this period abound. 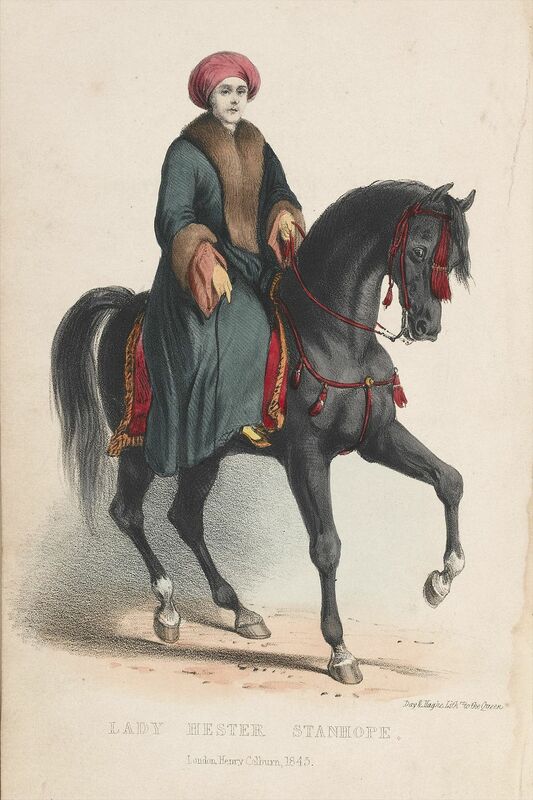 The Bedouin admired her horsemanship. Her baggage train consisted 22 camels—or perhaps 11 camels and 30 horses—supplied by Mohammed Ali Pasha, the Ottoman ruler of Egypt, when she traveled north across the desert from Cairo. Damascus hailed her as “queen.” She charmed them all. Inevitably, Michael Bruce left her. There being little for her in England (and her reputation in shreds because of her open affairs) Stanhope stayed on in Palestine. 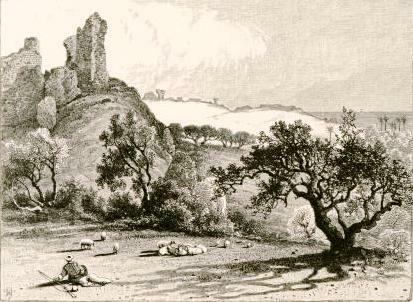 Soon after, she led an expedition in the company of the loyal Charles Meryon that has impacted her reputation ever since, the excavation of Ashkelon. This activity has been dismissed as “treasure hunting.” Indeed, she apparently chose the spot based on medieval manuscripts claiming gold had been buried on the site, and is reputed to have actually smashed and tossed away a priceless marble statue she found instead. That dismissive version of her activities is at best an oversimplification. Stanhope’s crew didn’t merely tear into Ashkelon in search of gold. She obtained permission from the Ottoman sultan in Constantinople for the dig, promising him the gold if she found it. 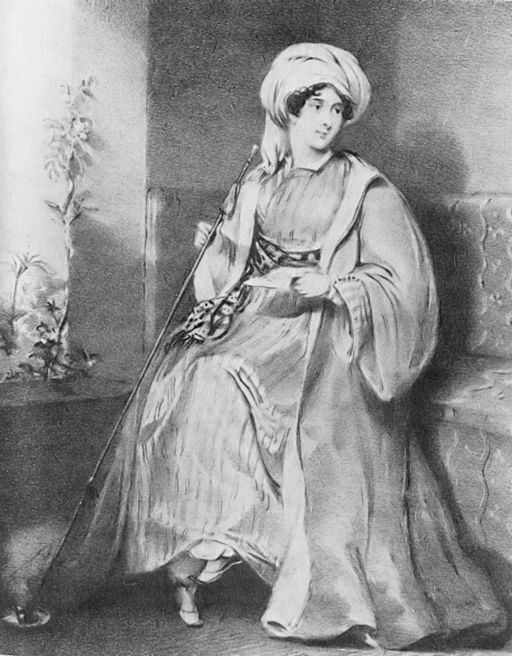 The governors of Damascus, Acre, and Jaffa were ordered to assist and an Ottoman official oversaw her work. Stanhope did extensive preparatory work studying both geography and local beliefs; Meryon documented the work carefully. He wrote that she destroyed the statue in order not to be considered a base relic-taker. Their work has seen considerable re-evaluation in recent years. While the excavation uncovered little of lasting significance, it can’t be easily dismissed. It brought travelers to Ashkelon who documented the place in pictures and text, it brought more openness to archeological excavation to the Ottoman Court, and it was without a doubt the first modern dig in the Holy Land. Augustus Pitt-Rivers (who may have been a distant relation), the reputed father of modern archeology, had not yet been born; Hester Stanhope got there ahead of him. Meryon stayed on with Stanhope into the 1830s, but eventually he left as well. She moved into an abandoned monastery high on a hill at D’joun in what is now Lebanon where she wrapped herself in eastern mysticism. It was said to be a strategic, easily defensible site. Did she view herself as a military presence? 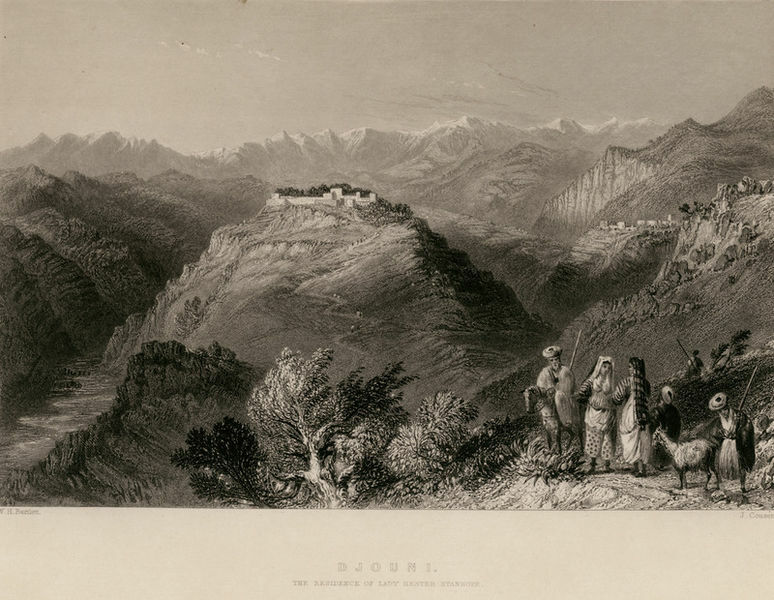 We know that when Ibrahim Pasha, son of Mohammed Ali whom she had so charmed in Cairo, conquered Lebanon, he left her house untouched, this, in spite of the fact that she angered Ali by taking in hundreds Druze refugees fleeing inter-clan warfare. Lady Hester lived beyond her means always. She used Bruce’s father’s credit long after Bruce left, but it dried up. Toward the end of her life the government cut off her pension to pay for mounting debts, leaving her more or less penniless. She wrote to Queen Victoria that, rather put up with the insult of having the pension withdrawn, she renounced it. For good measure she renounced her British citizenship and told Lord Hardwicke that she would never go back to England unless in chains. There are some signs her mind was slipping due to illness. She died at D’joun. She had sent away her servants or they had deserted her. She bricked up the entrance leaving herself inside with only cats for company. A British official found her body some weeks later and had her buried in her garden. Lady Hester most certainly qualifies as an adventurer! Caroline Warfield, having retired to the urban wilds of eastern Pennsylvania, she lets her many characters lead her to adventures across the world while she nudges them to explore the riskiest territory of all, the human heart. In addition to History Imagined, she is a regular contributor to The Teatime Tattler, a blog in the shape of a fictional nineteenth century scandal sheet. Her current series, Children of Empire, is set in the 1830s. What an absolutely fascinating woman! I love Hester! Such a frontrunner in the arena of women’s rights. Thanks for sharing her story with us. It is an honor to know about the people in history who did not follow the crowd like sheep. It is the brave people who dare to be different that have the greatest accomplishments. What a fascinating woman!! Love Hester for all that she is and for all that she is not! Great post. Lady H a great favourite of mine, as you know. I had the privilege of representing her for English Heritage at Walmer Castle in 2003, where I swanned around in a regency gown and spoke a little about her role in laying out the gardens. What a wonderful article. She’s such an amazing woman who was definitely ahead of her time! An amazing woman who was ahead of her time! Thank you for posting this article. I love reading about people who go against the grain. Concerning her final mental state, I wonder if her own nonconformity convinced her that she was “wrong” somehow; or perhaps, a critical public imagined her insanity as the only means to explain away her independence. I have no idea for certain, but she had suffered some illness which may have impacted her mental capacity as well.